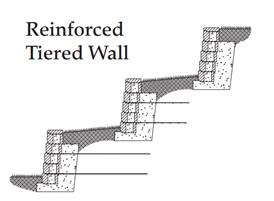 Whenever walls are constructed in a terraced arrangement the designer should consider the overall global stability of the structure. It is common to have the design grid lengths for the bottom terrace equal to at least 60% of the total terraced structure height. Subsequent terraces above would use similar rationale to determine their minimum grid lengths.